Propelled by the electrifying, Oscar-nominated lead performance of Bryan Cranston (TV’s Breaking Bad) as the legendary, larger-than-life screenwriter blacklisted for his political views, Trumbo offers enough Hollywood lore, colorful supporting bits, snappy dialogue and compelling moments to make any movie fan feel elated. 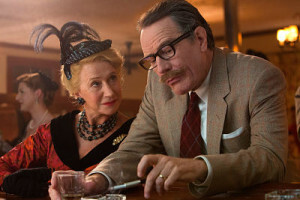 Cranston’s Dalton Trumbo is quite a character: a gruff, idealistic charmer, the highest paid scripter in Hollywood at one time, who habitually took to his bathtub to smoke, drink and pound out screenplays of all genres. Then, in the late 1940s, the House Un-American Activities Committee (HUAC) comes calling, citing the writer for his Communist ties. After being held in contempt of court, he becomes one of “The Hollywood Ten” and is imprisoned for nearly a year in 1950, then blacklisted by the studios. 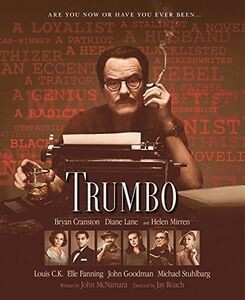 There’s already been a play, a documentary and a book on Trumbo (which this movie is based on), and director Jay Roach (the Austin Powers and Fockers movies as well as HBO’s Game Change), does commendable work making the elements here fresh and lively. Cranston’s powerful reading is complemented by Louis C.K. (Blue Jasmine) as a tortured screenwriter friend (a fictional composite character, oddly), Diane Lane (Secretariat) as his understanding wife and Helen Mirren (Woman in Gold) as the vicious gossip columnist Hedda Hopper. Also noteworthy are a series of spot-on portrayals of real-life movie stars and film industry notables who played roles in Trumbo’s life, including Edward G. Robinson (The Stranger), John Wayne (Red River) and mogul Louis B. Mayer, as well as Kirk Douglas (Spartacus) and director Otto Preminger (Exodus), both of whom had vital roles in smashing the blacklist by hiring Trumbo when nobody dared to employ him. Movie fans already familiar with the “Trumbo” saga may find the material overtly familiar, but should still be impressed by the authenticity and bravado the film offers. Meanwhile, those in the dark about Dalton Trumbo will no doubt enjoy this take on the fascinating life of the ingenious writer of such Hollywood classics as Roman Holiday, Spartacus and Exodus.